In the United States, we have nine time zones (yes, nine), though the continental US has four - Eastern, Central, Mountain, and Pacific. We are from Tulsa, Oklahoma, which sits snuggled in the Central Standard Time (UTC-6:00). Most of the United States (Arizona is the only exception I can think of offhand) also observes Daylight Savings Time, so for part of the year we adjust our clocks forward so as to enjoy the afternoon sunshine for a little longer after work. India on the other hand has only one time zone, called India Standard Time (UTC+5:30). They do not observe DST, which is kind of nice because you don't have to worry about resetting your clock. India used to have a few other time zones (Bombay, Calcutta, Madras, and Port Blair), but after declaring independence, they decided to have only one time zone. 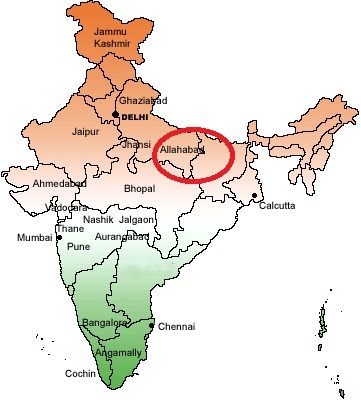 Basically, they found a city (Allahabad) that was in the dead center of the country, and used its time for all of India. And this is how the thirty minute difference was "created". As a random side note, IST was set up in 1947, but Calcutta and Bombay time was still used for a few more years. And there you have it - why India's time zone is at a mid-hour.